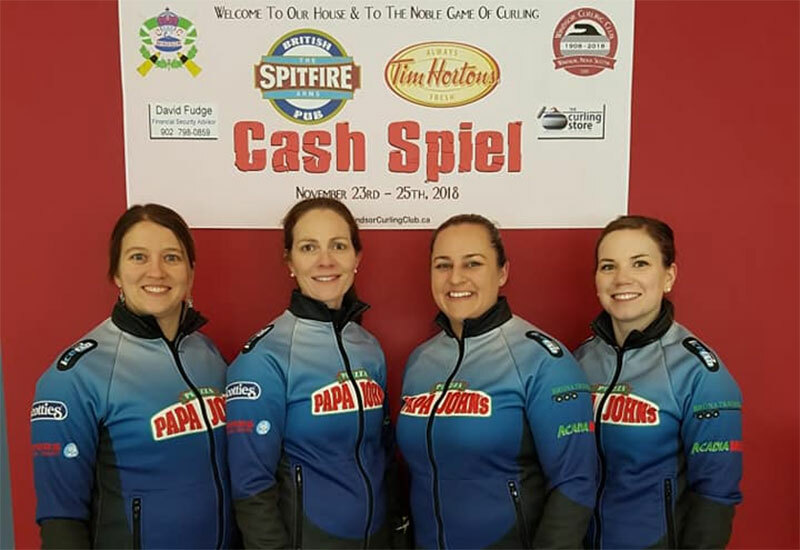 Sylvie Robichaud (Moncton, New Brunswick) wins the Tim Hortons Spitfire Arms Cash Spiel, defeating Suzanne Birt (Charlottetown, PEI) 9-2 at the Windsor Curling Club in Windsor, Nova Scotia. Robichaud with Melissa Adams at third, Nicole Bishop and Kendra Lister on the front end take home the $4,000CDN first place cheque along with 27.515 world ranking points, while Birt receives $2,000CDN and 20.178 world ranking points for their second place finish. Robichaud opened the scoring stealing 1 in the first end, then added steals in the second end and third ends to lead 3-0. Birt scored a single in the fourth end, then added a steal in the fifth end. Robichaud scored 2 in the sixth end, then added a steal of 4 in the seventh end for the 9-2 win. In the semifinals, Robichaud defeated Julie McEvoy (Halifax, Nova Scotia) 6-3 and Birt defeated Colleen Jones (Halifax, Nova Scotia) 7-2. Jones and McEvoy earned $1,500CDN and 15.592 ranking points for their semifinal finishes. In the quarterfinals, Robichaud defeated Jill Brothers (Halifax, Nova Scotia) 4-2, Birt defeated Nancy McConnery (Halifax, Nova Scotia) 8-2, while McEvoy defeated Mary Myketyn-Driscoll (Halifax, Nova Scotia) 6-4 and Jones defeated Colleen Pinkney (Truro, Nova Scotia) 5-2. Myketyn-Driscoll, McConnery, Pinkney and Brothers earned $1,000CDN along with 11.006 ranking points for their quarterfinal finishes. Robichaud went 2-2 in the 20 team round-robin pools qualifying round. In their opening game, Robichaud defeated Mary-Anne Arsenault (Halifax, Nova Scotia) 9-5, losing their next game to Pinkney 7-6. Robichaud lost to Tanya Hilliard (Dartmouth, Nova Scotia) 7-5, then responded with a 4-2 win over Veronica Smith (Charlottetown, PEI) in their final qualifying round match.